Tuscany’s lavish coast begs to be explored by bicycle, and we’ve mapped out the most breathtaking routes to help you do so, including the storied Strada del Vino, or wine road. Along the way, we bring you close to a rich and rustic culture. 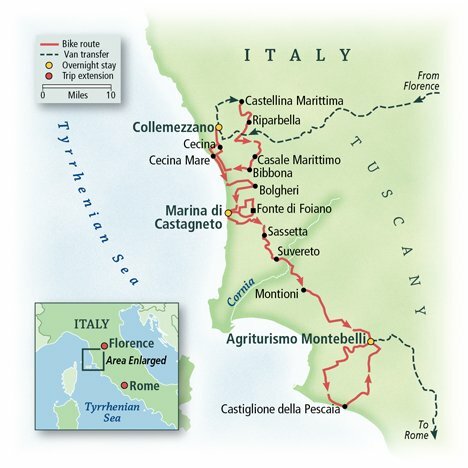 Ride through a canvas of cypress, cork, and pine forests hugging azure Tyrrhenian Sea waters. Uncover Etruscan and medieval history in magnificent hilltop villages. Savor farm-fresh cuisine with gracious hosts and the hospitality of fine agriturismos. Sample freshly pressed olive oil and celebrated wines. This is VBT’s Italy. This tour offers a combination of easy terrain and moderate hills, and is ideal for beginning and experienced cyclists. Our VBT support shuttle is always available for those who need assistance with the hills. Upon arrival at the Florence airport, claim your luggage and clear customs. If your luggage is lost, you must fill out a PIR form before leaving the customs area; VBT representatives are not allowed into the customs area. Also, make sure that your VBT luggage tags are attached to your bags so that your representative can identify you. The representative will be waiting outside the customs area in your arrival terminal and will be holding a VBT sign. He or she will help you transfer to your hotel (approximately 30 minutes). If you are going to be delayed meeting our transfer representative for more than 15 minutes due to delayed or lost luggage, please let our Airport staff know by calling or sending a text message to +39 347 85 74 265. Our drivers are generally able to wait for up to 45 minutes from the time your flight lands, after which you will be responsible for your own transfer. However, they might be able to reschedule your transfer if they are aware of the delay. You may also contact our One Call travel assistance to advise of your delay, and they will contact our transfer service. You have the rest of the day free to explore the historic city of Florence and enjoy its Renaissance architecture and famous museums, using VBT’s City Information as your guide. In the evening, relax in one of the city’s restaurants and sample the local cuisine. VBT Air Package and Pre-Trip Extension guests: This morning, spend more free time exploring Florence’s wonderful museums, shops and cafés. Take in the spectacular Duomo, the centerpiece of the city. Perhaps walk across the Arno River on the famous Ponte Vecchio, browsing the goldsmith and silversmith shops that line the bridge, modern-day replacements of the butchers and grocers of centuries gone by. See works by Leonardo da Vinci, Michelangelo, Caravaggio, Botticelli and Raphael at the Uffizi Gallery (reservations are required). Or just relax and enjoy a cappuccino or espresso in the Piazza della Republica, the perfect place for people watching in this vibrant city. At 12:00 p.m., meet your VBT Trip Leaders in the hotel lobby. They will be easy to recognize, as they will be wearing VBT staff garments. 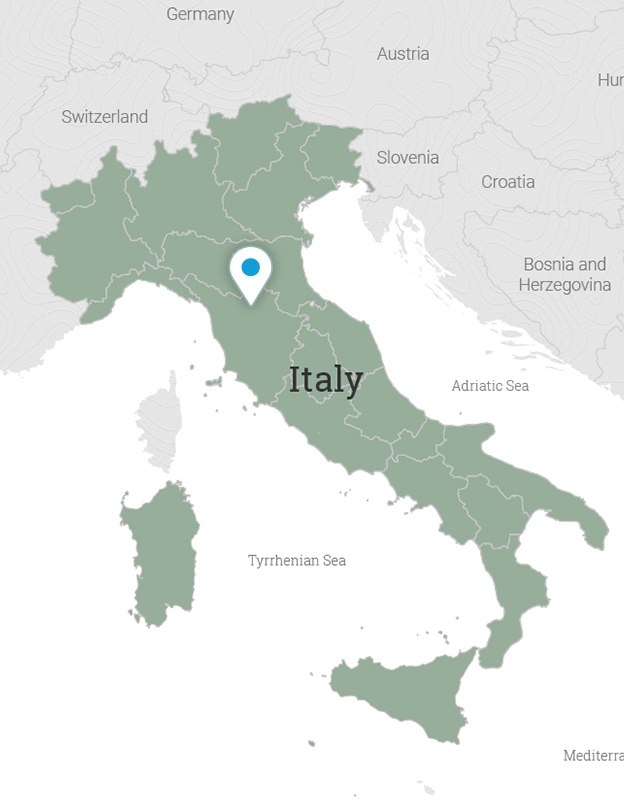 Once the entire group is assembled, you transfer by private motorcoach (approximately 2 hours) to Collemezzano. During the transfer, the coach will stop so you can buy lunch. On arrival in Collemezzano, you proceed to the Agrihotel Elisabetta, a family-run agriturismo hotel that produces much of its own wine, olive oil, fruit and vegetables. This inviting accommodation and its smiling owner, Luigi Brunetti, will surely enchant you. 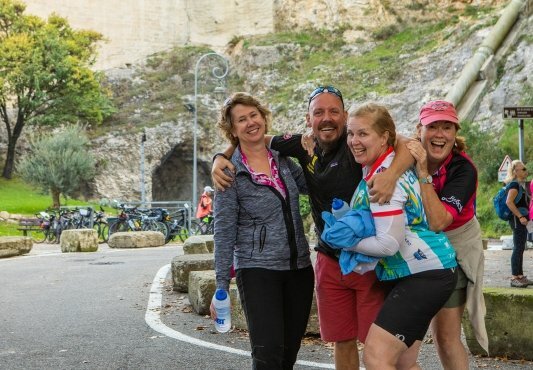 After settling in, meet your Trip Leaders for a safety and bike-fitting session before a short warm-up ride over gentle hills and past old farmhouses shaded by cypress trees. Later this afternoon, our gregarious host Luigi takes you on a guided tour of his wine cantina. Here, sample some of Luigi’s varietals while sharing the day’s stories with your small group. Dinner is at the hotel restaurant. After breakfast, cycle from Castellina Marittima on a scenic road of the Maremma Pisana, riding high in the hills of the Cecina Valley. Your view from these splendid seaside slopes extends from the coast and faraway islands to the valley nestled between the Tyrrhenian Sea and the mountains on Tuscany’s Costa degli Etruschi—the Etruscan Coast. 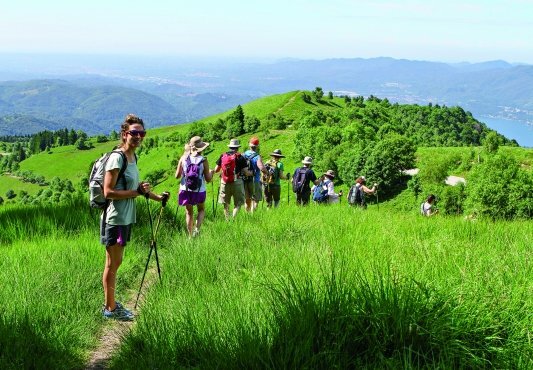 During this invigorating reel through the rolling countryside, you pass the “3 Comuni,” or three hilltop towns, and pedal your way to Casale Marittimo, the most picturesque of the trio. 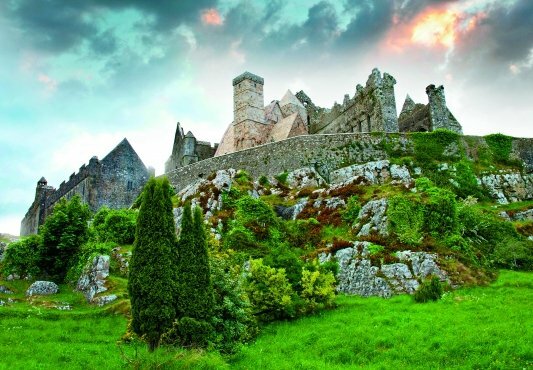 Upon arrival, admire its medieval castle and the 12th-century Sant’Andrea Church. For lunch, you will gather in a scenic spot with your fellow riders for a delicious picnic prepared by your Trip Leaders. Afterward, continue cycling downhill through the charming village of Bibbona, entering the fragrant Cecina pine forest. Your route back to the hotel traces the azure waters of the sea, giving you a chance to go for a swim if you wish. If you prefer, you may return in the shuttle. This evening is at leisure at Agrihotel Elisabetta, where dinner is on your own. Begin your day by pedaling the Cecina Mare promenade en route to the Strada del Vino, one of the most beautiful of Italy’s wine roads. Your route skirts the Ornellaia vineyard to Bolgheri, traversing gently rolling hills. Bolgheri is one of the most prestigious wine regions in Italy. In addition to its own DOC wines, you will want to sample the Super Tuscans that revolutionized the Italian winemaking industry. Bolgheri is also known for its Viale dei Cipressi, a cypress-lined avenue immortalized in the poem “San Guido” by Giosuè Carducci. You may want to stroll along this boulevard after enjoying lunch on your own. This afternoon, shuttle to the Tombolo Talasso Resort, your deluxe hotel right on the Tyrrhenian Sea, or continue cycling on easy back roads. Whichever you choose, you’ll gather together a bit later for an Italian aperitivo with your VBT Trip Leaders. In the evening, enjoy a home-hosted experience in a typical Tuscan countryside house. Your host, Chicca (pronounced “Key-ka”), will open her home and you will cook dinner with her. Chicca is the founder of Cooking in Tuscany, a culinary-gastronomic association that promotes traditional Italian and Tuscan cuisine in Italy and abroad. The goals of the association are to experiment with and research old traditional recipes, to use and emphasize typical products of the season, and to promote the culture and tradition of the region through the knowledge of local ingredients. And, of course, to share the hospitality and warmth of an Italian family! Chicca will present a one-hour, hands-on cooking class, after which you will have the chance to dine on your own creations at sunset under the pergola. After breakfast, continue riding the historic Strada del Vino to the family-owned and operated Fonte di Foiano olive-oil mill. During your visit, you’ll meet the Di Gaetano family, who lead you on a private tour of the press and workshop. Taste the oil during a degustazione (sampling) on the terrace. During your tasting, Simone Di Gaetano explains the differences and varied flavors among Italy’s olive-growing regions. 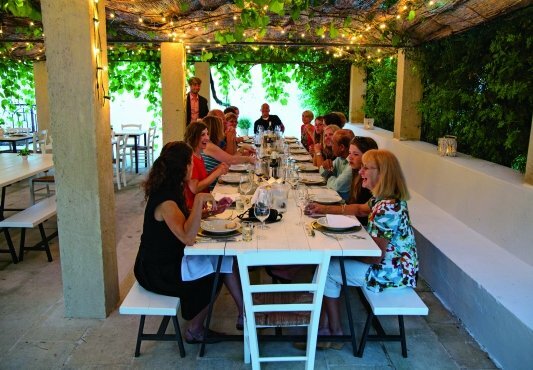 Afterward, find your place at the table on the farm’s grounds for a delicious vegetarian lunch—prepared by his brother and chef Paolo, using organic and fragrant vegetables. After, cycle back to your hotel, stopping at Daniela’s excellent bicycle shop along the way, a local treasure. Once you’ve returned, you might stretch out in the sand at the hotel’s private beach, or relax in one of the five thermal swimming pools at the Wellness Center at an extra cost. Tonight, your Trip Leaders can suggest a restaurant to try for dinner on your own in the lovely seaside village of Marina di Castagneto. Today’s adventure from Castagneto follows one of the most picturesque routes in Europe. Cycling past chestnut, cork and pine trees, medieval estates, and fields of sunflowers, you arrive in Suvereto, an ancient village whose origins date to the year 1000. Overlooking the Costa degli Etruschi, it is a true jewel, rich in history and art, set in the green valley of the River Cornia. Suvereto displays remarkable architectural harmony: Its ancient walls enclose paved streets lined with stone houses, historic buildings, impressive churches and shadowy cloisters. Continue on a countryside ride to Montioni and Cura Nuova where you stop for lunch on your own. Then continue riding through the scenic Maremma, a beautiful area of flat grazing lands, or join our shuttle. Your destination today is a welcoming country retreat, Agriturismo Montebelli. 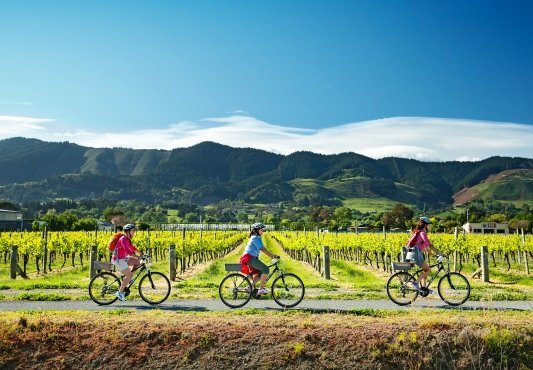 An extra challenging and scenic option has been designed by our Trip Leaders for avid cyclists. Situated on immaculately maintained grounds blanketed with olive trees, vineyards and wildflowers, tonight you may explore all that your hotel has to offer. You will be greeted by the friendly owner Alessandro Tosi, who will take you to visit the vineyards and let you taste some of the wines that he proudly produces – two of which (Acantos and Fabula Riserva) won a gold medal. Dinner tonight is a barbeque buffet, freshly and sumptuously prepared on the beautiful hotel grounds. After breakfast, cycle the soft foothills of the high Maremma, a scenic, lush landscape traversed mostly by locals. Later in the morning, you’ll arrive in the lovely seaside resort of Castiglione della Pescaia. This city’s layers of history extend from Roman occupation through its many subsequent rulers. In the Middle Ages, the city suffered repeated pirate attacks, so a fortress was built to defend the city. You may walk up to the castle and explore the Old Town, taking in spectacular views of the islands of Elba and Giglio. 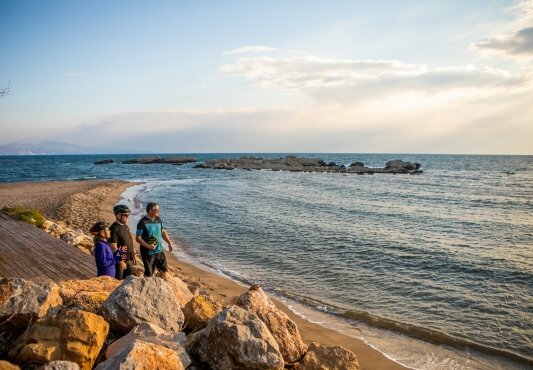 Castiglione della Pescaia is an ideal spot for last-minute shopping or, in the summer, sunbathing on the beach. If you prefer not to cycle today, you may enjoy leisurely pursuits at the Agriturismo Montebelli, perhaps strolling the vineyards or relaxing at the intimate spa. Tonight, you’ll enjoy a memorable farewell dinner together. VBT Air Package & Post Trip Extension guests: After breakfast, transfer to your central Rome hotel for your final overnight stay. Your hotel room may not be available until 2:30 p.m. You may store your luggage with the reception desk. If you have chosen the independent Post-Trip Extension to Rome, you will remain at this hotel for three nights. When you arrive today, VBT’s Rome representative can answer your questions and offer optional city walks to help you make the most of your time in Rome. 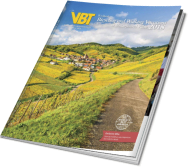 VBT’s City Information includes recommendations for restaurants, attractions and transportation in Rome, and will help you explore on your own. After breakfast* this morning, you will transfer to the Rome airport (approximately 40-60 minutes, depending upon traffic) for your departing flight**. Please ensure you are ready in the hotel reception area at the designated transfer time. VBT-Bicycle-Vacation-only guests: Your tour starts at 12:00 p.m. at our Florence hotel (Hotel De La Ville, Piazza Antinori 1, Firenze, phone +39 055 2381805). Your Trip Leaders will meet you in the lobby and will be wearing VBT staff garments. You will transfer by private coach to Collemezzano. During the transfer, the coach will stop so you can buy lunch. If your arrival at our Florence hotel is later than 12:00 p.m. or if you are delayed, you must take a taxi (approximately 2 hours) at your own expense (approximately €150) to the Agrihotel Elisabetta. Also, if you are making your way to the centrally located meeting point from Florence’s city center, you must transfer at your own expense. Contact the Florence hotel to advise of any travel delays or changes and ask the front desk to pass the message on to your VBT Trip Leaders. VBT-Bicycle-Vacation-only guests: After breakfast, you’ll transfer to our Rome hotel. Your trip ends here at approximately 11:30 a.m.-12:00 p.m. You are responsible for your own transfer to the airport for your flight home. Luigi Brunettis Agrihotel Elisabetta is situated on a splendid hill in the village of Collemezzano, today part of Cecina in the province of Livorno. After many years as a successful chef throughout Europe, Luigi realized his dream of returning to Italy and purchasing a farm. Today, this farm and antique farmhouse surrounded by vineyards, olive groves and fruit trees welcomes guests into 31 country-style rooms. While here, perhaps you will enjoy wine, fruit and olive oil produced right on the premises, as well as gourmet cuisine prepared by Luigi himself and served in the hotels restaurant. Enjoy panoramic views from the terrace, take a dip in the pool, and retire to your comfortable room with television, telephone, minibar and private bath with shower. WiFi is available in the lobby and in select rooms. Hotel dei Mellini is located on a quiet backstreet near the Tiber River, convenient to the city’s transportation network and at walking distance from the central Piazza del Popolo. The design is refined and elegant. The hotel was once a pair of family palaces. It features a furnished rooftop terrace with an open view of Rome’s extraordinary skyline. The beauty of nature suffuses this secluded estate, whose immaculately maintained grounds are dotted with olive trees, vineyards and flowers, all cultivated organically. Choose from a wealth of activities including tennis, swimming in the outdoor pool and horseback riding. Here, qualified instructors utilize the Equine Guided Education approach, which maintains that horses can teach us something about ourselves and how we move through life and connect with others. Walk to the ancient oak tree and to the stone labyrinth, which both provide amazing views of the surroundings. 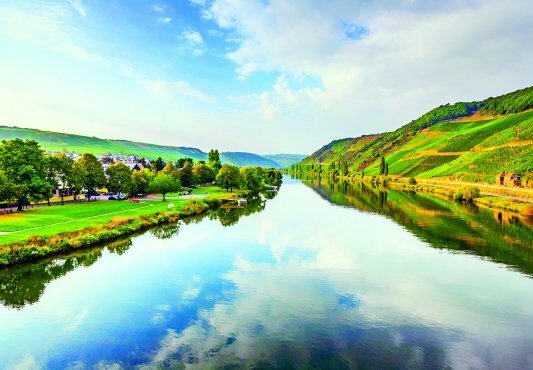 The restaurant at this eco-friendly accommodation serves traditional dishes prepared from fresh, local produce, and you may also enjoy the spa, which offers a variety of treatments as well as a massaging waterfall fountain, Turkish bath and sauna. Your room is furnished with 19th-century Tuscan furniture and has a TV, telephone and private bath with hairdryer. The Tombolo Talasso Resort is set on its own private beach in the charming seaside village of Marina di Castagneto Carducci on the Etruscan Coast. 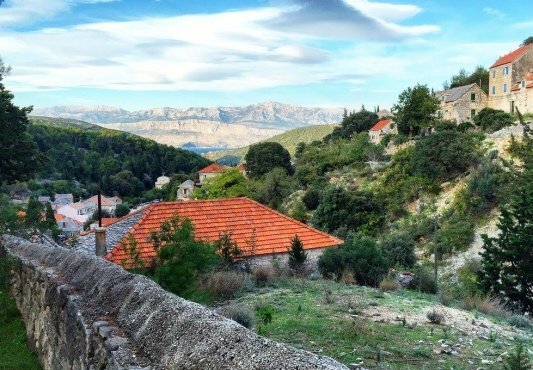 During your stay, you will be surrounded by enchanting views of green hills, vineyards and olive groves. Indulge in the luxurious wellness center, where five thermal pools are fed by sea water, and massages and other treatments help soothe the soul and relax the body. All rooms are air conditioned and have a flat-screen TV with SKY channels, a minibar, telephone, hairdryer and bathroom with shower or bathtub. WiFi is available throughout the resort. This hotel has been completely restored and lies in a convenient location in the heart of Florence, a few steps from the famous Duomo, on the fashionable shopping street Via Tornabuoni, which is closed to car traffic and quiet. Enjoy spacious, comfortable accommodations in your private room. At the hotel, a local VBT representative will be available at 5:00 p.m. to answer your questions, help you organize your time in Florence, and suggest optional walking and biking tours to discover the most secret corners of the city. You’ll have the rest of the day free to explore, using VBT’s City Information as your guide. Please note: To visit the Uffizi Gallery, you must make reservations in advance. To reserve online, go to http://www.florence-museum.com. For information on all Italian museums, go to http://www.italy-museum.com. The day is yours. You may wish to set out and explore the city’s most famous museum, the Uffizi Gallery (advance reservation required, see above). You might also enjoy strolling along the shop-lined promenades of the Via Tornabuoni. Then, cross the river to the Oltrarno side of the city to unwind in the lovely Boboli Gardens, or grab some gelato in Piazza Santo Spirito. You have another day free to explore the historic city of Florence and enjoy its Renaissance architecture and famous museums. Don’t miss exploring the signature of the city, the Duomo, with its soaring Brunelleschi dome. Next door lies the Baptistery with its massive copper Gates of Paradise designed by Ghiberti. Nearby, at the Piazza della Signoria, you can admire more sculptures including a replica of Michelangelo’s David. But the real thing awaits you a little farther north at the Galleria dell’Accademia. In the evening, relax in one of the city’s many fine restaurants and sample the best of la cucina fiorentina. Spend today exploring the city on your own. You can step out of Italy while you’re still in Rome with a visit to the Vatican, an independent state. The Vatican museums are filled with magnificent art that goes far beyond such well-known pieces as Michelangelo’s Pieta and Sistine Chapel ceiling. VBT recommends you purchase your Vatican museum ticket well in advance. Today’s opportunities are endless. You might visit the Forum, the political and commercial center of ancient Rome when the empire was at its greatest power. Various emperors constructed the temples, monuments and other buildings here over a period of nine centuries. Today, you can still see the Curia where the Roman Senate met. Walk up Palatine Hill, where tradition says the first settlers of Rome built their huts under the direction of Romulus, and which was later the home of Caligula, Nero, Tiberius and Domitian. Tour Rome’s famous Catacombs, located in tunnels carved out of rock along the Via Appia (Appian Way). Or spend an idyllic afternoon in the gardens of the Villa Borghese, one of Europe’s most elegant parks. And by all means, do as the Romans do—sip espresso, savor Italian wine and take the time to enjoy la dolce vita. After a full day of independent exploration, enjoy one of Rome’s fine restaurants. Delve deeply into Roman history during an optional walking tour of ancient Rome, available today. Highlights include the Coliseum, the Roman Forum, the Capitolio, Marcello Theater and the Jewish Ghetto. This two-hour program may be booked with your VBT hotel representative upon arrival in Rome (it may not be booked in advance). After breakfast* this morning, you will transfer to the Rome airport (approximately 40-60 minutes depending upon traffic) for your departing flight**. Please ensure you are waiting in the hotel reception area at the designated time.